Thanks to celebs and “selfies,” Siam Paragon beat out Times Square and Disneyland. Instagram, a Facebook-owned photo sharing app boasting more than 150 million monthly active users, recently shared its third annual top ten list of the most photographed places in 2013. 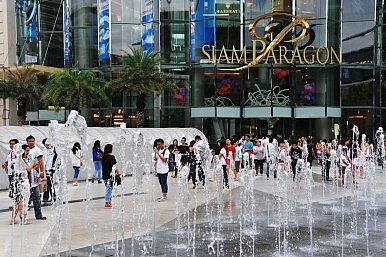 In a world full of natural and man-made wonders, like the Grand Canyon and the Great Wall of China, it might come as a surprise that 2013’s top location was a monument to consumerism – the Siam Paragon shopping and entertainment complex in the heart of Bangkok. How could a Thai shopping mall beat classic photo locations like the Eiffel Tower and the Taj Mahal? A combination of celebrity endorsements, vanity, and Thai people’s love of social media seems to be the answer. Many of Thailand’s top celebrities and brands have embraced social media as a marketing tool. In Thailand specifically, Instagram has “cannibalized” Facebook – with more check-ins via the photo service than its catch-all parent network. Perhaps even more significant than the impact of celebrity power users is the fact that Thais are obsessed with taking “selfies.” The term selfie is so common that it was added to the Oxford Dictionary earlier this year, with self-shot photos a ubiquitous sight on social media for as long as smartphones sported front-facing cameras. Last May, Tech in Asia reported on Thailand’s rapid social media growth. Between the first quarter of 2012 the first quarter of 2013, Facebook grew by 28 percent. That figure pales in comparison to the expansion of Instagram – which grew by 163 percent in the same period. Thai Instagrammers posted more than 21 million photos in the first four months of this year, averaging 178 uploads per user. “Instagram’s rise coincided with mass-adoption of smartphones in urban areas in Thailand. For many first-time smartphone owners, Instagram was a logical app to install from day one,” added The Next Web. Siam Paragon – which also houses an aquarium, a movie theater, a bowling alley, and an outdoor Christmas Garden – was Instagram’s number two most photographed location last year. The 2012 winner was Suvarnabhumi Airport (BKK). Though BKK was bumped to number nine for 2013, it and Siam Paragon are the only non-U.S. locations in the top ten – a testament to Thailand’s love of Instagram.